We have been told that ASUS will have just a single GeForce GTX 960 video card at launch, the ASUS STRIX GTX 960 DirectCU II OC (part number STRIX-GTX960-DC20C-2GD5). This is a fully custom, factory overclocked card that carries an MSRP of $209.99. For that price you end up with a card that is said to be 12% faster than the NVIDIA reference card thanks to the 1291MHz core clock with a 1317MHz boost clock. ASUS also overclocked the 2GB of GDDR5 memory up to 7200MHz from 7000MHz, so there is a slight bandwidth improvement on the memory side there as well. 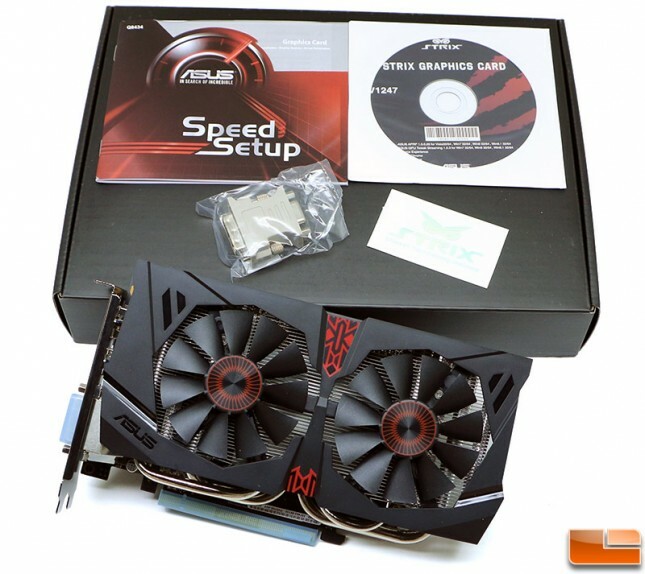 The retail box for the ASUS GeForce GTX 960 STRIX graphics card is a pretty slick looking box. 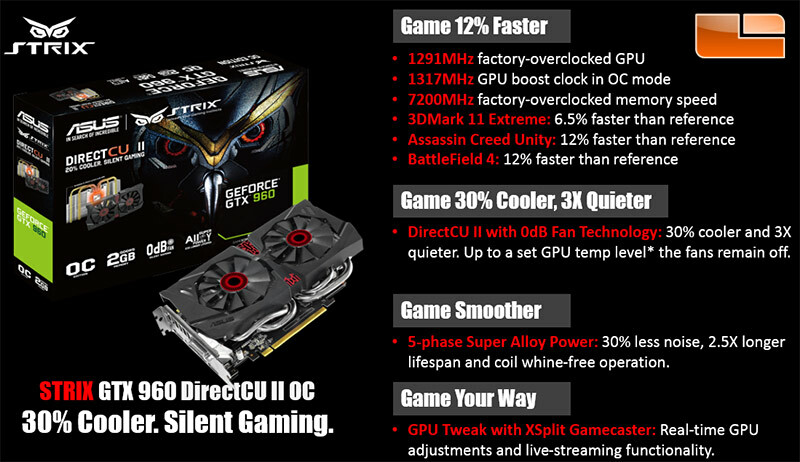 The front of the STRIX packaging above puts emphasis on a couple of key features, though mentioned twice is the silent gaming. Obviously ASUS is focusing on the silent gaming aspect of the GeForce GTX 960 STRIX! Up along the top of the packaging, the ASUS GeForce GTX 960 STRIX packaging points out that it is using the DirectCU II cooler, 20% cooler and silent. 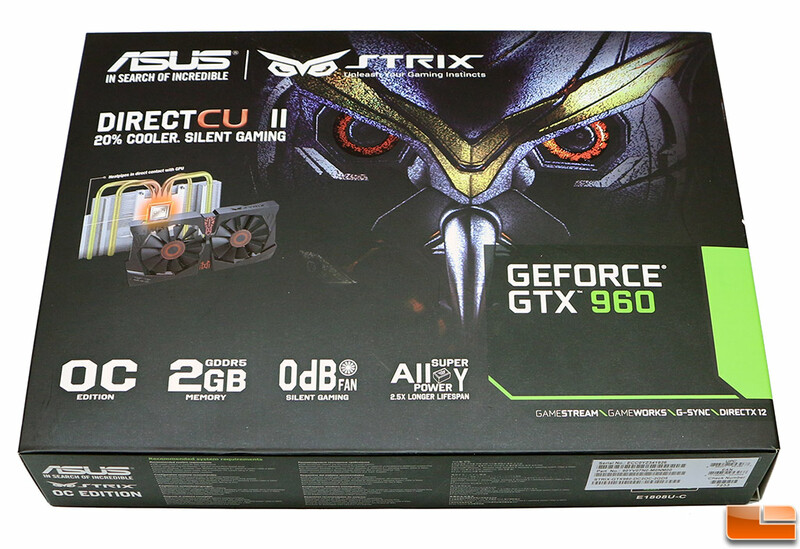 Towards the bottom edge of the packaging ASUS lists out a couple more key aspects of the GeForce GTX 960 STRIX. Along the bottom edge it’s pointed out that it’s the OC Edition, 2GB of GDDR5 memory, 0dB fan, and Super Allow Power with a 2.5x longer lifespan. 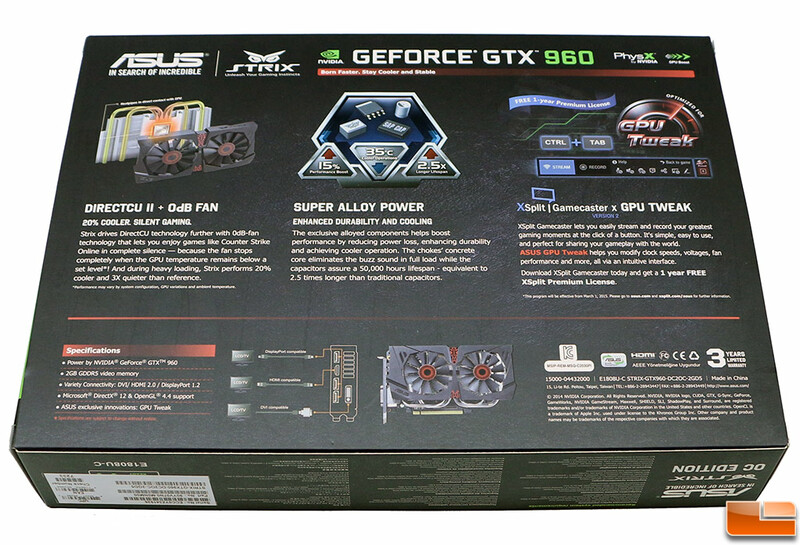 The back of the ASUS GeForce GTX 960 STRIX packaging has no shortage of marketing text. The first feature that ASUS shows off back here is the DirectCU II – 0dB fan. Top center of the box is the super alloy power for enhanced durability and cooling. The Super Allow power consists of a couple different components that all work together for the utmost efficiency and overclocking ability. The third key feature back here is the GPU Tweak with XSPlit Gamecaster. The GPU Tweak software is a handy little utility that makes overclocking the ASUS GeForce GTX 960 STRIX simple to do. The XSplit Gamecaster will make it easy to record and share all your gaming glory with the click of a button. 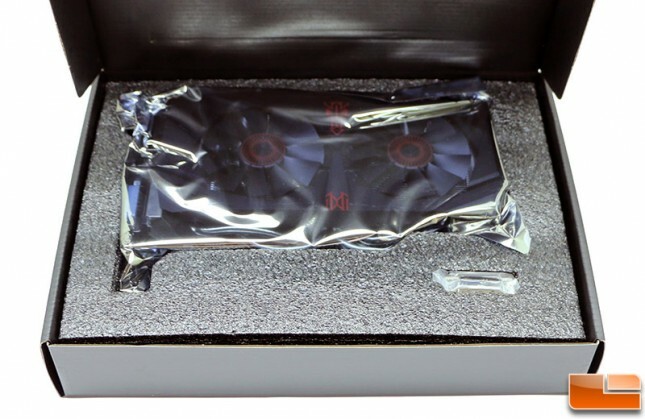 Opening up the ASUS GeForce GTX 960 STRIX packaging, the card is securely packed inside the box. No chance of it shifting in here and getting damaged! There certainly isn’t much included with the ASUS GeForce GTX 960 STRIX, but not much is needed with it. There’s a little bit of paperwork, driver and utility disc, 15pin D-Sub to DVI adapter, case sticker, and of course the ASUS GeForce GTX 960 STRIX card in all of it’s glory!